As a maker, Cesare Candi adapted completely to his Genoese environment – none of his work could be described as Bolognese in style; after all, like Enrico Rocca before him, most of his adult life was spent in Genoa (see part 1). Though it is unlikely that Praga or Rocca taught him directly, his early work is very much influenced by them (his Stradivari models resemble those of Rocca while his Guarneri models are closer to those of Praga). Candi never quite escaped his experience as a maker of plucked instruments, a vocation that engaged him for over 15 consecutive years: he used the French-inspired external form rather than the internal one used by the Roccas; and he passed his linings over the corner blocks – the method customarily used for guitars – which before him was quite an unusual feature in violin making but was adopted by most of his followers. Candi’s making combines great technical finesse and creativity. Like Praga’s, his instruments tend to be large and long (particularly the violins, which are around 35.8 cm) and have wide upper bouts. Violins from before 1905 are virtually unknown and even after this time his violin production was slow. 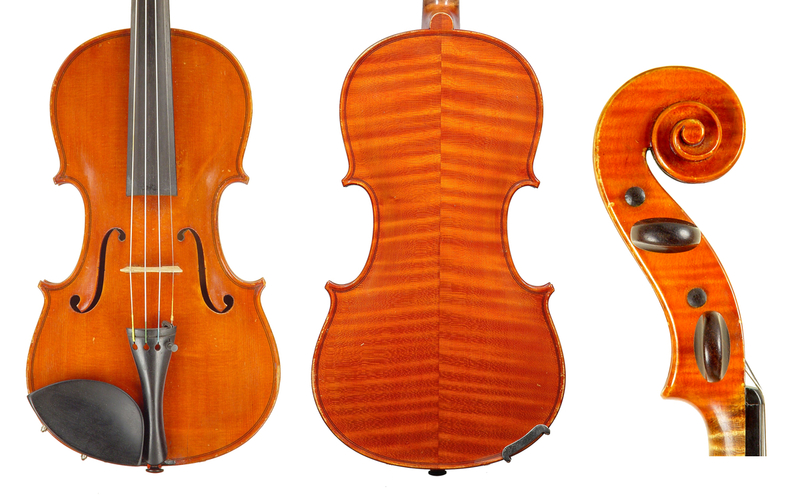 The early instruments are mostly Guarneri models, with backs often cut on the slab, and have a rich, soft, oil varnish of an orange-brown color. Other early Candi instruments are embellished with a rather gaudy-looking ivory inlay that does little for modern tastes other than show off his marquetry skills. Candi also made his own accessories, in particular his unique boxwood pegs and tailpieces, still sometimes found on his instruments. These are beautifully ornamented and, while adding charm to the instruments themselves, also enhance their collector’s value. A few of his followers also copied him in this endeavor. Candi’s long f-holes are particularly distinctive (as are those of his best pupil, Paolo de Barbieri), with their stems cut at an approximately 17-degree angle, rather than parallel to the ribs. The reason for this is unclear, but it seems likely to have been guided by his acoustic convictions and was observed by most of his followers. His beautifully inlaid, narrow purfling is artistically placed in a rather pronounced channeling along the carefully rounded-off edge. From the mid-1910s Candi adopted a Rocca-influenced Stradivarian model, though it is more carefully finished, with heavier and much deeper channeling at the edges, and purfling that finishes in an elegant triangle deep inside the elongated corners, with a hint of a bee-sting. 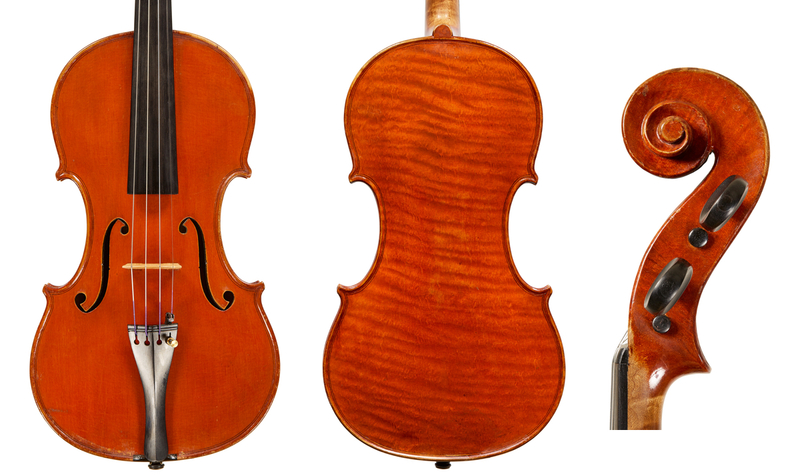 The arching is intelligently designed and aesthetically pleasing, while his scrolls are among the most carefully constructed of all modern violin making. They are decidedly Stradivarian even on his Guarneri-modeled violins, boasting the highest possible level of artistry. On earlier examples they are a little more worked and slightly deeper-cut than on his later instruments, but they are consistently elongated and have a rather pronounced tail. Throughout the 1920s and 30s Candi increased his violin family production. After around 1930 much of his work is flatter, less sophisticated and more quickly finished than previously, yet it is still refined. At that time Giuseppe Lecchi had a hand in much of his output. While Candi’s varnish is among the most beautiful of modern makers, in extreme cases it tends to be too candy-apple red, a trait sometimes followed by his pupils in their personal work. By 1940 Cesare Candi had completed approximately 220 violins. According to William Henley he made a total of 320 violins, 30 violas, 25 cellos, a large number of guitars, mandolins, lutes and even bows; bows from other regions are rarely seen during these period, but several other Genoese makers partook in their production. During his mature period Candi branded his instruments internally above and below the label, ‘C. Candi-Genova’, and numbered each one on the label. Some of Cesare’s instruments after 1925 may also have been made with the help of his less-successful brother, Oreste, who continued with the production of plucked instruments throughout his career as well as being a prolific violin maker. Oreste’s work while stylistically quite original – almost eccentric at times – is generally lacking in finesse. His materials, too, are generally inferior to those of his brother and his varnish rarely possesses the softness and lucidity of Cesare’s. 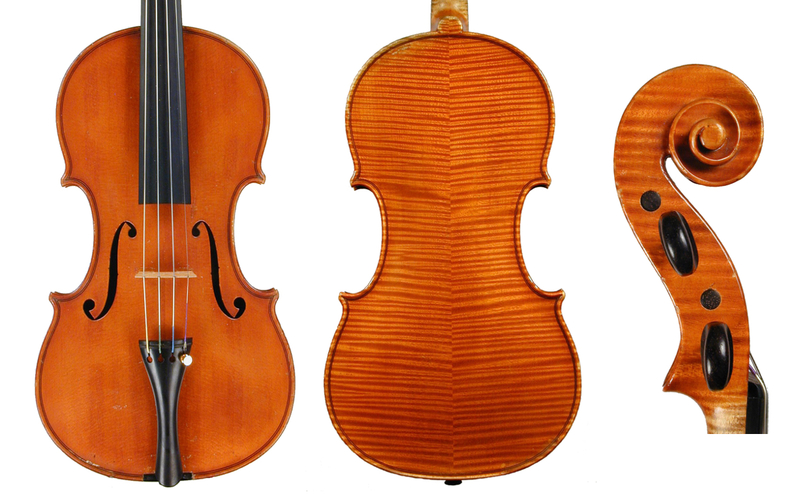 Oreste mainly followed Cesare’s Stradivari–Rocca model, often using highly figured maple for the backs. The pretty orange-red varnish of this period is thinner and somewhat harder, yet more transparent than that of his earlier work. Cesare’s most talented and faithful pupil and relative through marriage, Paolo de Barbieri, was born in Genoa in 1889. He began working with Candi around the time of Enrico Rocca’s death, when Candi increased his production of violin family instruments (see part 1). De Barbieri’s hand may well be present in a few very fine Candi instruments made from 1915 up to around 1919, when de Barbieri opened his own workshop. 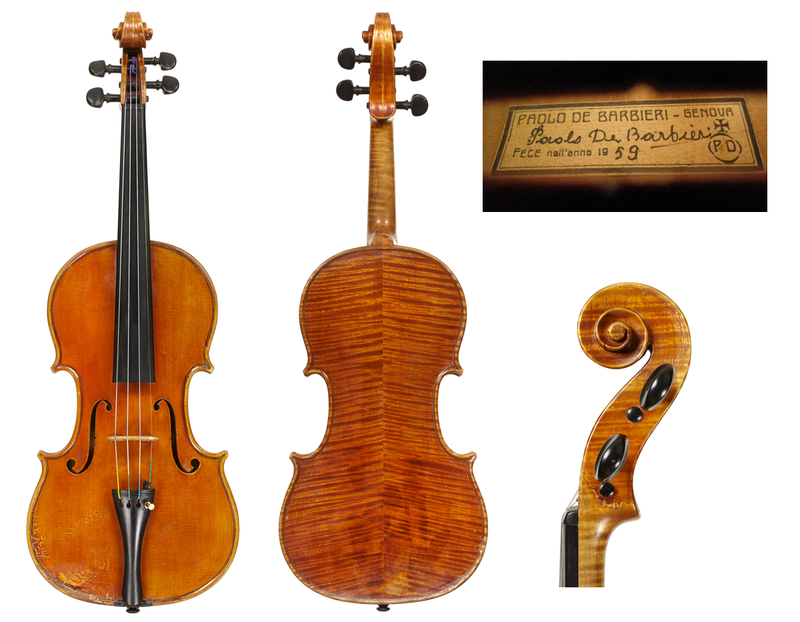 I have seen several violins from this period labeled Candi that are virtually indistinguishable in quality and workmanship from others bearing de Barbieri’s original labels. De Barbieri assisted Candi in curating Paganini’s ‘Cannon’ Guarneri ‘del Gesù’ in the 1940s, taking over the role after Candi’s death in 1947. His very personal interpretations of the ‘Cannon’ are generally an exaggeration of the model in all aspects. They are never actual bench copies, but rather are somewhat simplified copies of Candi’s early work. It is said that he abandoned the use of that model in favor of Stradivari models when he was replaced as curator by Giuseppe Lecchi in 1949. 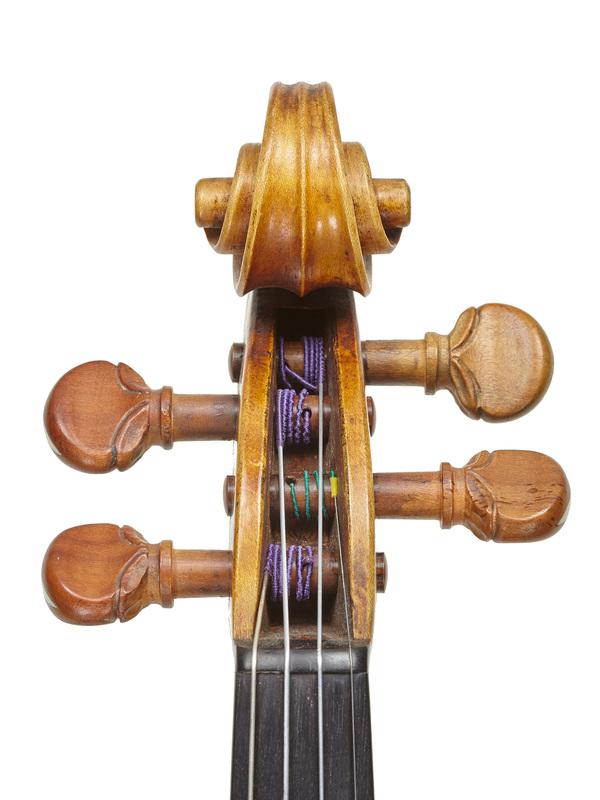 De Barbieri made broad, amply wooded, heavy-edged instruments with wide though neat purfling. At times his oil varnish is as beautiful as that of his teacher and the finest modern Italian work, and the quality of its texture and color surpasses that of most other modern Genoese makers. This type of varnish is orange-red and rarely seen. Generally, his varnish, applied abundantly over a nice yellow ground, varies in color from a violent red to brownish-orange and, at times in the later years, a pinkish-red; the texture, however, is invariably soft and pleasant. De Barbieri scrolls, always technically satisfactory, generally lack the artistic grace of those by Candi; they do not conform to the Guarneri-model instruments and, especially in instruments made from the mid-1930s onward, they can appear too large. De Barbieri used the best available materials, with a preference for strongly figured maple and one-piece backs. In the later years of his career, however, his work becomes heavier and less inspiring. The instruments are often branded in a fashion similar to that of his master: several times internally and at the lower rib, ‘P de Barbieri-Genova’. He generally numbered the instruments internally on the left upper rib. De Barbieri entered several international exhibitions and competitions, where he received medals, awards and positive critique. In the 1949 Cremona competition his quartet won a silver medal and a special prize for ‘the best quartet by a living Italian violin maker’. Defying all influences beyond that of his teacher, he worked industriously to an excellent standard. He died in 1962, having produced around 370 violins and a good number of violas and a few cellos. Born in 1895 and originally a carpenter, Lecchi turned to violin making only in 1923, when he apprenticed to Candi. His hand becomes visible in Candi’s more commercial production starting from around 1925. Lecchi opened his own workshop in 1933 but continued to collaborate with Candi through the 1930s. His high level of craftsmanship earned him several medals at international competitions and exhibitions, bringing him recognition and eventually taking over from de Barbieri as curator of the Paganini ‘Cannon’ Guarneri. 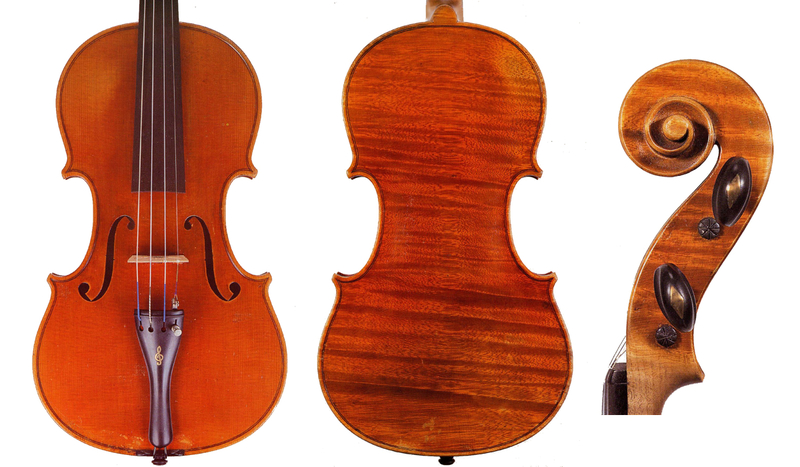 Despite this position, Lecchi rarely copied Guarneri, instead preferring Stradivari or Rocca models, the latter being slightly broader and flatter. His violins are intelligently proportioned and generally 35.5–35.6 cm in length. His beautiful early examples are clearly derived from Candi’s workshop but are decidedly lighter in character than those by Candi or de Barbieri. Some visually pleasing Guarneri-modeled instruments exist. Unlike Candi and de Barbieri, Lecchi avoided exaggerated features in his work, but when using the Guarneri model he sometimes cut the soundholes in an extremely angular, pointed manner. Despite this peculiarity, his work gives the impression of a moderate and accurate approach, if sometimes at the expense of the passion and fire we tend to expect from Italian makers of his calibre. He created some exceptional specimens into the late 1950s, but his work deteriorated around the mid-1960s and he died in 1967. His instruments are consistently branded ‘G. Lecchi – Genova’ in rather large letters in many places. He made a number of cellos and violas, the latter of various sizes, including some of immense proportions, as well as many guitars and bows. 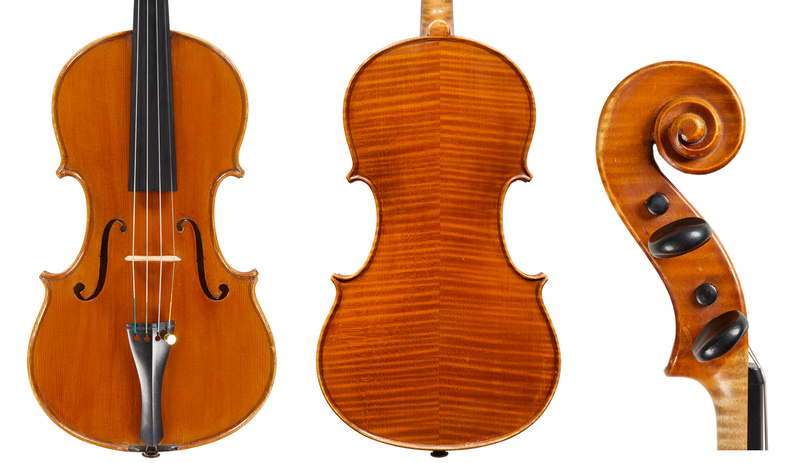 Bellafontana, the final Genoese maker of the period, brought the city’s fine modern violin making tradition to a graceful close. Born in Genoa in 1906, he was a pupil of Oreste Candi. He was well educated in the arts and played the violin; he was even a member of Genoa’s Symphony Orchestra for a time during the Second World War. Sadly his workshop was destroyed by bombings in both 1942 and 1944, and again in a flood in 1970. Like the Candis, during his early career Bellafontana made more guitars than violins and probably worked as an assistant to Cesare Candi or another maker, as the instruments most often encountered bearing his original labels were made after the Second World War. He did, however, participate in the Cremona Exhibition of 1937 and went on to win a bronze medal in the same exhibition in 1949. He later succeeded Lecchi as curator of Paganini’s ‘Cannon’. Bellafontana died in 1979 and in the relatively short time since then his production has already been subject to the ‘double upgrade’ system, whereby a maker’s instruments are given the label of a more famous name, and at the same time third-grade Italian or foreign instruments are passed off as his work. Bellafontana’s better instruments have been relabelled Eugenio Praga, Cesare Candi and even Annibale Fagnola, all of whose work he used as models quite successfully. 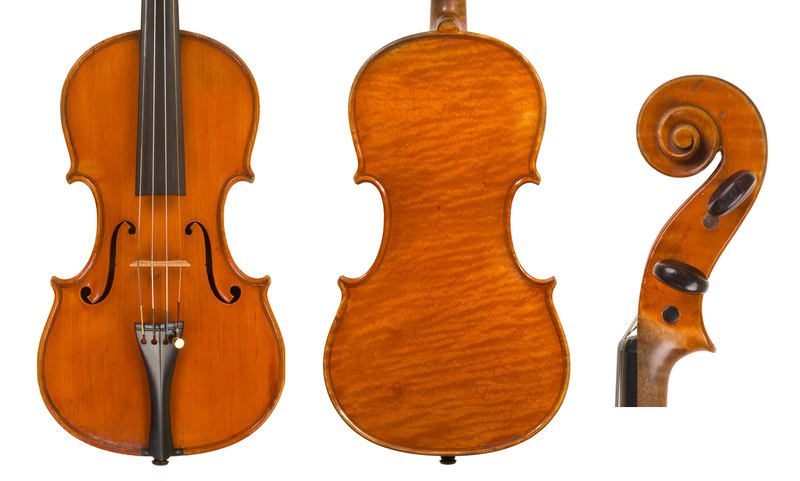 Bellafontana’s Guarneri-modeled instruments from the 1940s and 1950s can be striking, with refined workmanship and a lustrous orange-yellow varnish, occasionally somewhat sharp, exaggerated soundholes and a smallish, very flat model. Other instruments have a dull, dark varnish, though the woodwork is always refined. The scrolls at times show individual expression; at others they are Guarneri style or reminiscent of Cesare Candi. 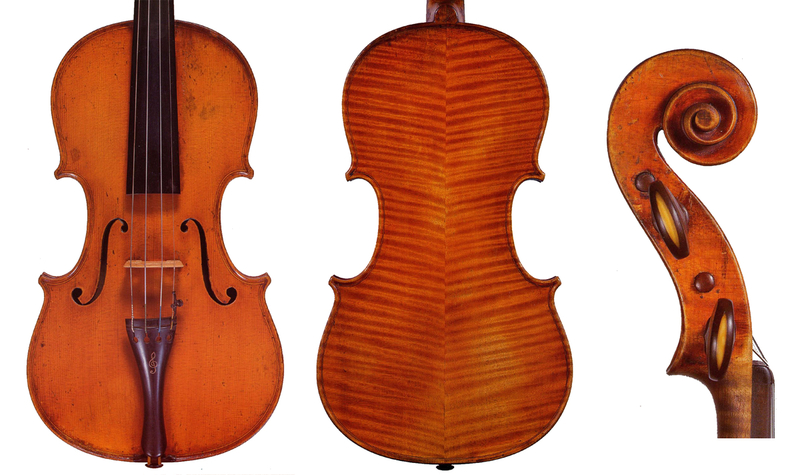 Apart from his violin-family instruments and guitars, Bellafontana made numerous good bows. He usually branded his instruments internally and used several different labels: on the early ones he cites his teacher, ‘…allievo di Oreste Candi’; later he sometimes adopted the border and design of the Fagnola labels. Born in 1876, Gaibisso lived and worked in Alassio – a small Ligurian coastal town located approximately almost exactly halfway between Genoa and Nice. He lived in South America for a short time but is also known to have worked in Nice for François Bovis, another ex-workman of Nicolo Bianchi. Though after the Candis, Gaibisso was the oldest maker of the modern Ligurian school, his arguably best and most easily recognised instruments, covered with splendidly rich orange-red varnish, were made in his maturity between about 1920 and 1940. 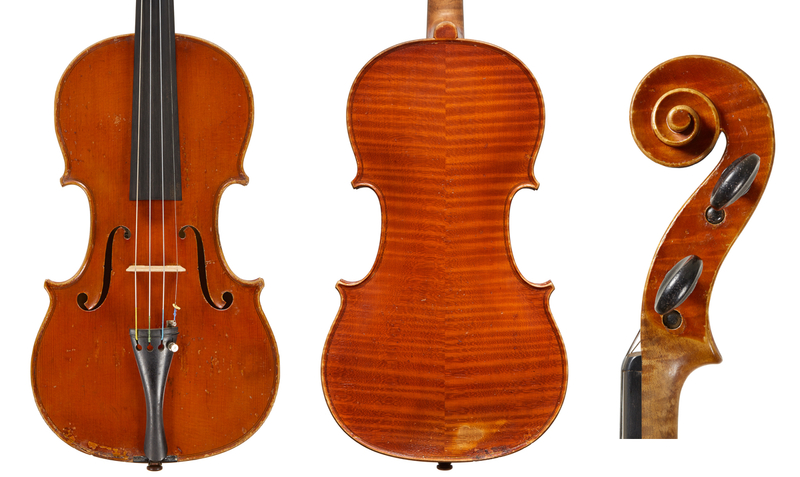 Some, modeled after Guarneri ‘del Gesù’, resemble those of Cesare Candi and though he was not officially one of Candi’s pupils, he was clearly influenced by the Genoese makers. For instance, the interior work is neat and the linings often continue over the corner blocks in line with the Candi tradition. He was a meticulous workman, often using first-class materials. The arching is always flat and broad, recalling that of the Roccas. The cut and the positioning of the slightly fluted soundholes is aesthetically perfect. The purfling is accurately and elegantly inlaid inside a channeled edge. Often, especially in earlier examples, this channeling is quite sharp and pronounced. The corners are mostly short, regardless of the model used. The scrolls are somewhat elongated. Several types of Gaibisso labels exist and later examples bear a brand in smallish letters ‘G.B. Gaibisso Alassio’, both on the inside back and on the outside lower rib at the joint. Gaibisso died in 1962, having made about 200 violins, 14 violins and 10 cellos; although some sources suggest that he produced as many as 450 instruments, this seems excessive. Gallinotti was an unusually talented violin maker who won a range of awards. A native of Solero, Piedmont, and born in 1885, he apprenticed as a cabinet maker. His first encounter with instrument making apparently came during his time as a prisoner of war in World War I, when he was ordered to make a violin. On his return to Italy after the war, he took up violin making as a profession and opened his own workshop. Although Gallinotti mainly worked in Solero, he also spent some time in Genoa around 1920 and came under the influence of the Candi school. His later work becomes more personal, with many exceptional examples made between the mid-1920s and the mid-1940s that are some of the most handsome instruments of the school (see this 1928 example). These boast fine materials and superb oil varnish of a rich reddish-brown color, in particular on his Stradivari-modeled instruments. From the late-1940s the charm and attention to detail seen in Gallinotti’s earlier work tends to disappear: his varnish loses its deep hues and oil content; the arching becomes simpler; and, while his purling remains neatly inlaid, it becomes overly wide. 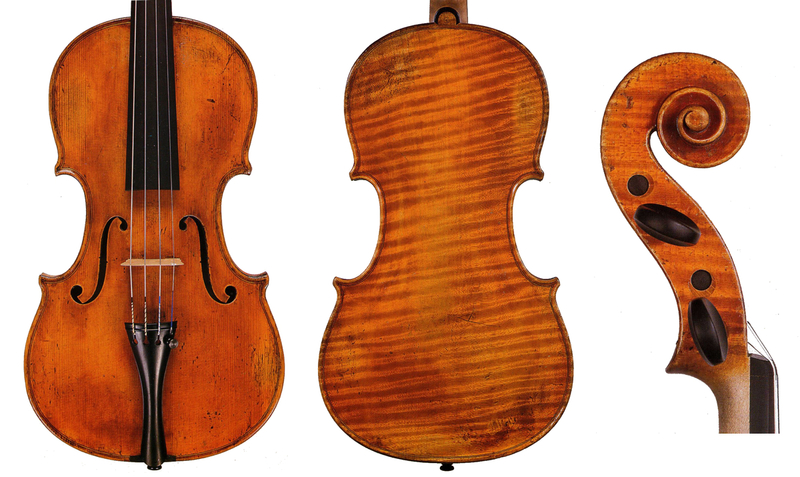 Some violins bearing his original, signed labels from this period may have been made by supporting, inferior hands. It seems that from the 1950s he virtually abandoned violin making, reverting mainly to the production of plucked instruments, especially guitars. One of the longest living violin makers, Gallinotti died in 1979 in his home town.